Season’s greetings and best wishes for 2017 and I trust everyone managed to find some form of relaxation over the Xmas break. 2017 has all the makings of being an exciting year for orienteering in NZ. We are now firmly into the home straight for Oceania and the WMOC within AWMG. The considerable effort which Stephen Reynolds and his Auckland team have provided over the past two years looks like being rewarded with strong support from both home and international competitors for both events. I know that Stephen and team will not relax until the final event has been completed and the last control brought in. Over the next few months, in line with any major event, there will be multitudes of operational issues to finalise and sort through. Orienteering Bay of Plenty(OBOP) has also organised a Middle Earth event during the midweek between Oceania and WMOC to complete an incredible week of orienteering especially for our international visitors. This is no mean feat given the size of the club and their limited resources. From within both organisations has come a plea for support to provide the necessary resources to host events of this scale. This is a timely reminder that we, like most other sports, are totally dependent on volunteers for the successful delivery of events. So I start with a plea for AWMG and OBOP. Whilst ONZ can assist through their Event Liaison personnel (Russell Higham), it is a case that both organisations are seeking plenty of “feet on the ground” or “bums on chairs” – so do consider offering your services if you have any spare time or availability to assist with these events. Still with cap in hand, ONZ also has several vacancies which we are eager to fill. Besides committee positions, we are also seeking nominations to replace the first two longest serving Council members who must stand down under the terms of our new Constitution. Nominations close on 14 February 2017 – so again please ask yourself if you could take on such a governance role or possibly identify another candidate who would be suitable and ensure you bring this opportunity to their attention. No matter how good our strategies or Business Plans are – we cannot deliver effectively without adequate resources. So time to take a long hard look and consider how you can help?. To align with the new ONZ Constitution we are now inviting applications from suitably skilled and experienced members to join the ONZ Board. The ONZ Board is seeking to fill 2 vacancies – Pip Poole and Jane Harding’s current terms are up. The appointment is for a 3-year term. The Council recently undertook a skills assessment to ensure we are covering all the desired governance skills identified as best practice but with every change in Board membership there is always an adjustment around skill balance. We welcome applications from members with current or previous business experience especially in the areas of finance and governance. Applicants must be current financial members of an ONZ Club. Application forms are available on the ONZ website. Thanks to everyone who has signed up as a volunteer for the AWMG next year. It’s going to be an amazing few weeks. We still need about 60 marshals to watch over the course and controls for the sprints in particular. If you are available to help, we do need you to sign up with AWMG BEFORE 20 January. Being a Marshal is easy and you will also get the AWMG volunteer uniform! To signup please go to http://www.worldmastersgames2017.co.nz/get-involved/volunteers/apply/. Sweden, Finland, Australia, NZ, UK, Czech Republic, Norway, Japan, Switzerland, Denmark, Canada, USA, Russia, Estonia, Belgium, Austria, Germany, Slovakia, France, Bulgaria, Brazil, New Caledonia, Portugal, Ukraine, Hong Kong, China, Latvia, Italy, Lithuania, England, Kazakhstan, Romania, South Korea, Isreal, Luxembourg, Greenland, Hungary, South Africa, Slovenia, Croatia and Netherlands. WANTED: Current or past NZ Defence Force personnel who are interested in competing at the Auckland World Masters Games. Nick Engleback has confirmed the NZ Defence Force is keen to support a team or teams to enter the Games. Nick is looking for any orienteers who want to participate. Anyone with a military connection such as an employee of NZDF, service member or member of cadet or reserve forces. If you are keen please contact Nick (n.engleback@gmail.com) asap as entries close 31 January. Day 1: Friday 14 April 2017 – Oceania Sprint (Easter Friday) – Unitec Institute of Technology (Mt Albert Campus), Auckland. The following grades system for North and South Island and New Zealand Secondary School Champs was approved by the ONZ Council and endorsed by NZSSSC for implementation from 2017 onwards. School championships gradings by school year, rather than athlete age. At Championship grade, junior will run yellow; intermediate run orange; senior run red. At Standard grade, junior run white, intermediate run yellow, senior run orange. A Novice grade be introduced at senior, running yellow. The novice grade will be included in the school points system, with the winner of a novice grade obtaining no more than 5 points. 24 May 2017 – We want YOU as WOD ambassador! 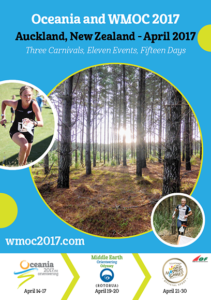 World Orienteering Day (WOD) will become an increasingly important activity for the future of orienteering. The interest from many countries is huge and it’s growing even in the Nordic countries. As you maybe know, Turkey was outstanding last year with almost 50 000 participants. We are now getting ready for this year’s WOD on May 24, and as Project Manager I have the responsibility to inspire and implement WOD in such a way that we reach the target 500,000 participants at 5,000 locations in 100 countries by WOD 2018. An important part of this work is to promote WOD, which we will do in many different ways. The WOD ambassadors is one of these. We will contact many national team runners in several countries and therefore we are asking you if you are interested in becoming a WOD ambassador. We are proud to present our WOD ambassadors: Thierry Gueorgiou, Ida Bobach, Jerker Lysell and Jonas Leandersson. Always have a positive approach when you are discussing WOD with other athletes, coaches, organisers and of course media. Tell them that WOD is important for the future of orienteering. Tell them that we want to use WOD as a fun promotion activity of orienteering. We believe that WOD can make the feeling of orienteering more cool and exciting for kids and young people. We want to make orienteering more visible and more accessible so we can attract more people to the great sport of orienteering. If you have one, please use your website or blog to promote WOD. You can also use e.g. a slide when you are doing speeches for youngsters at seminars. We will provide you with WOD-logos for this purpose. We would also like to feature you in connection with the WOD newsletter, where we would be happy to quote you what you think of WOD. For this purpose I will be happy if you can send me a photo of you. To be available May 24, 2017 (if possible) for local event or some of the National Federation’s event. Maybe running with the students and writing autographs.